Hey guys! As you may remember, in part 1 of “Craft Tutorials and How Tos You Might Have Missed” we helped introduce you to some easy DIY craft ideas for the home. Well, good news-a similar list is back again! 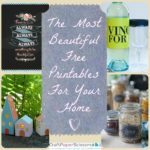 These free and simple crafting tips will help make your DIY adventures magical and are helpful to any and all skill-levels. Although you may think that you are doing crafting the easy way, these home craft tutorials will help you avoid common mistakes that every crafter makes. 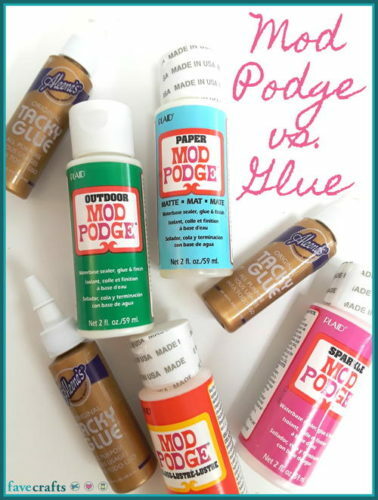 Learn how to find multiple crafting uses with an old toothbrush with 17 Crafty Uses for an Old Toothbrush and discover which crafting materials are best for your specific project in Mod Podge vs. Glue. If you want to jazz up your wardrobe with tie-dyed t-shirts but don’t want to spend a lot of money then try this beginner-level craft technique Crumple Tie-Dye Technique. 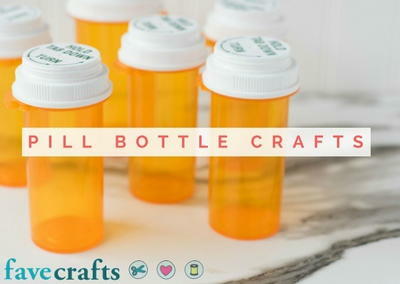 Any crafter loves a good DIY organizing project and with Pill Bottle Crafts: Reuse Pill Bottles with this Crafty Guide you can learn how to create DIY storage the affordable way! 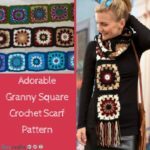 If knitting or crocheting is more your speed, find out what the best yarns are for that DIY afghan with Best Yarn for Blankets. 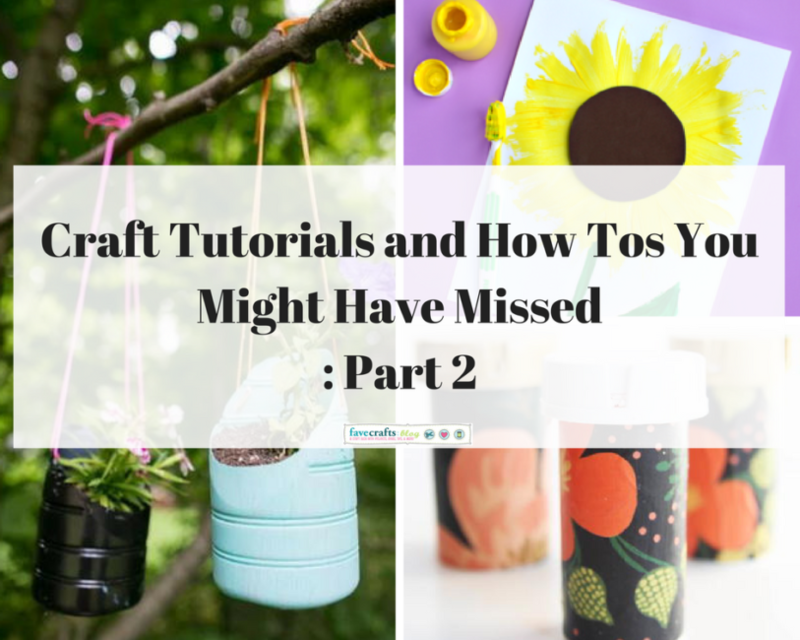 Even if you are an experienced crafter, having access to free crafting tutorials can never hurt! 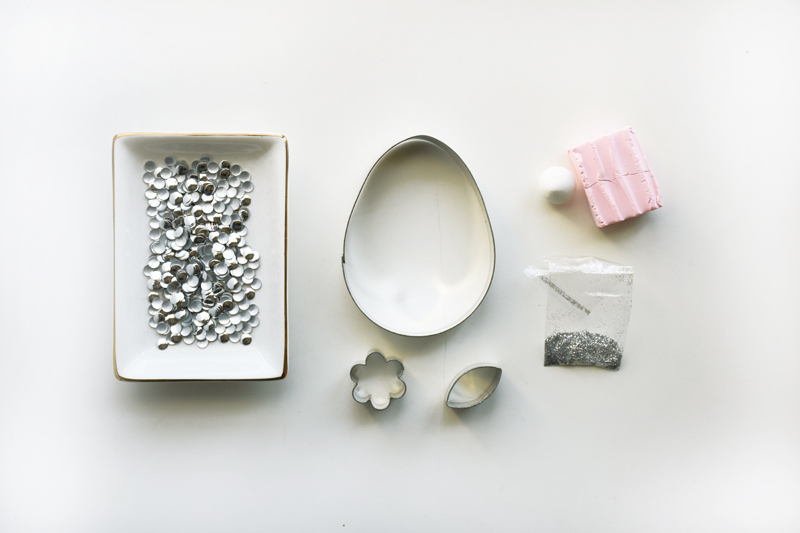 These simple craft how tos will teach you how to create unique, beautiful pieces for your home without the added stress and expense. Make crafting fun and relaxing again by using this helpful list as a crafting resource for you and your friends! The best way to learn about helpful crafting techniques is by sharing with those around us. So what are you waiting for? Start reading part 2 for priceless crafting insight! 9. What Is Shibori Tie Dye? 11. What Are the Best Knitting Needles for Beginners? 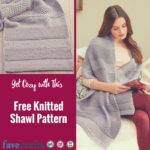 Don’t forget to sign up for the FaveCrafts newsletter, Quick and Crafty, for daily crafts and tips delivered straight to your inbox. 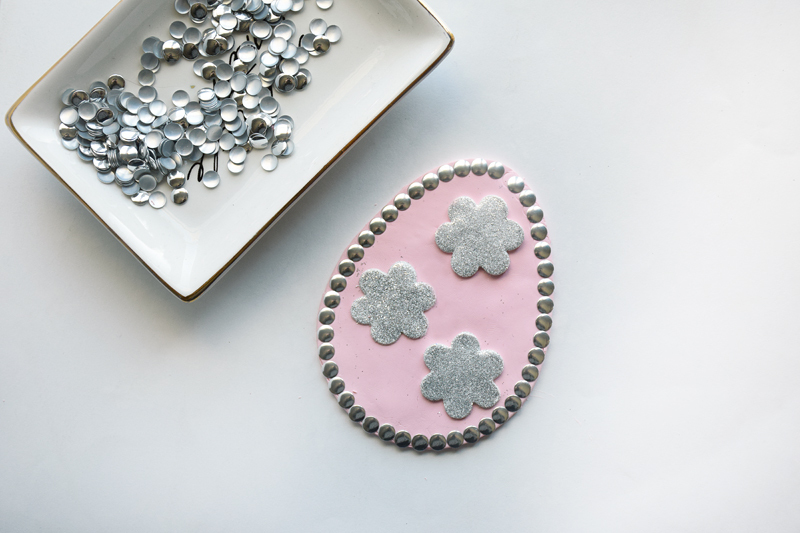 Show your Easter spirit with these cute studded clay ornaments! 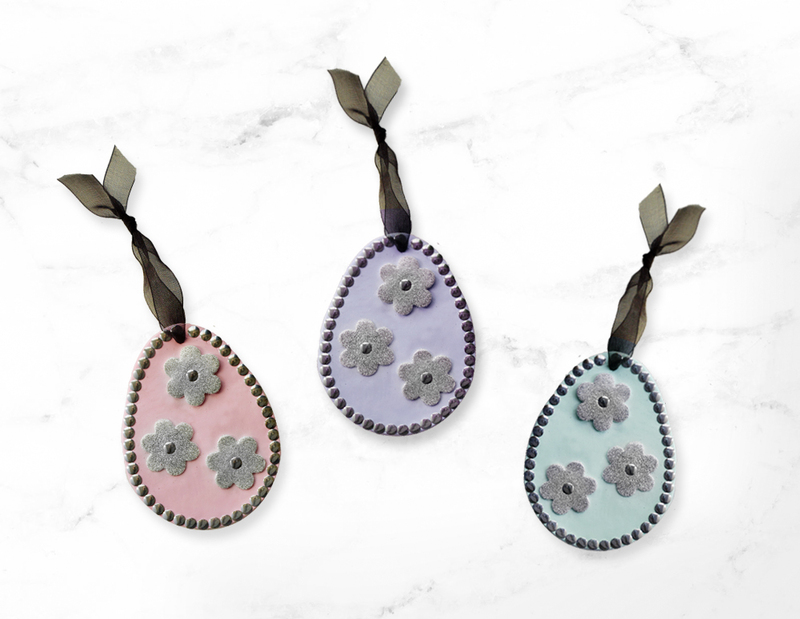 These fun DIY decor pieces are a great way to add a bit of sparkle and shine around your home, and the spring flowers add a cheerful touch! 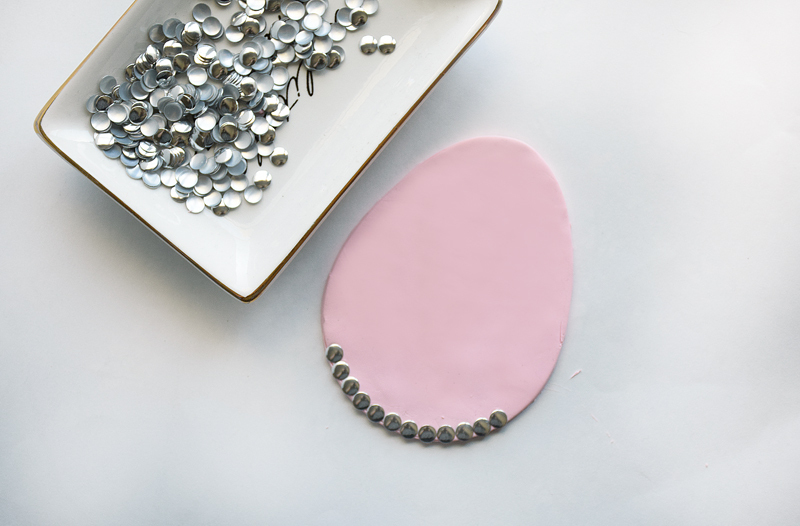 It’s an easy technique of cutting clay using cookie cutters, and then simply pressing in studs before baking. You can really make these ornaments any color you’d like, and use them to hang on indoor plants, on a fireplace, doorknobs, or drapes. Get creative with these! I also like to hang these from a light fixture over your Easter dinner table. 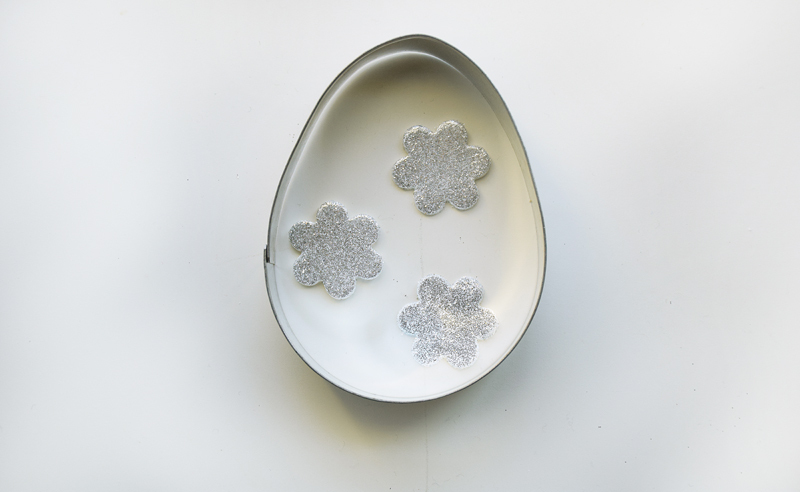 The bright silver studs add a modern touch to otherwise traditional decorations. Step 1: Gather materials. You will need polymer clay (oven bake — I use Sculpey or Fimo), fine glitter, an assortment of mini cookie cutters or clay cutters (find at a food specialty store like Sur la Table or a craft store like Michaels) – I used an egg shape and then mini flower shapes – small studs (these were iron-on studs I found at Michaels), and finally organza ribbon for your top tie. Step 2: Make the glitter accents first. Roll out one color of clay until it’s about 1/4″ thick. 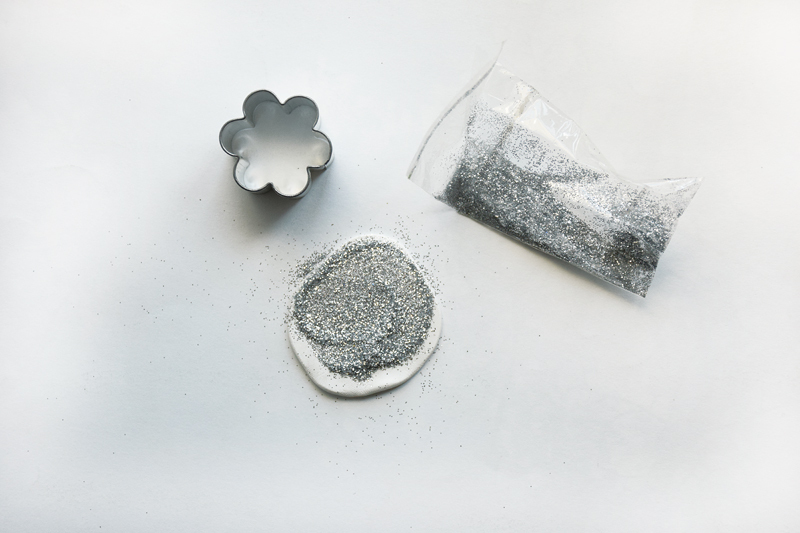 Press and rub on glitter to the top surface until it’s adhered and sticking, covering the entire surface. 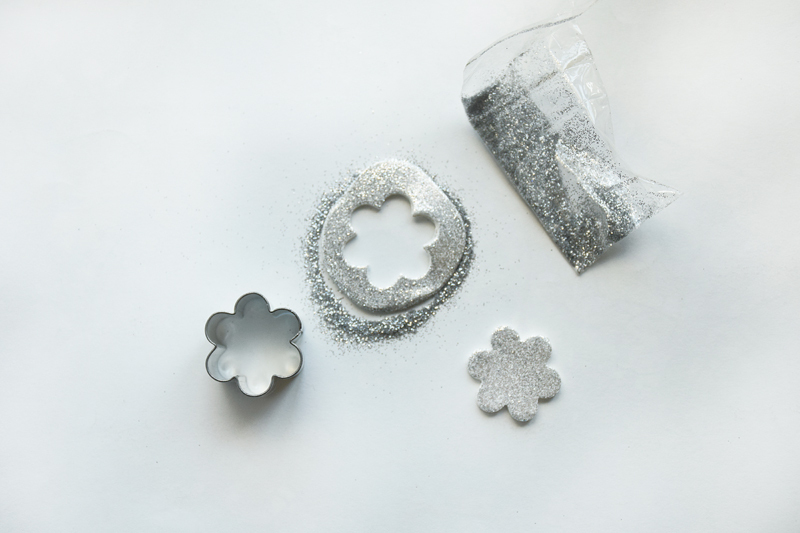 Step 3: Press down the cookie cutter and cut out your first flower. 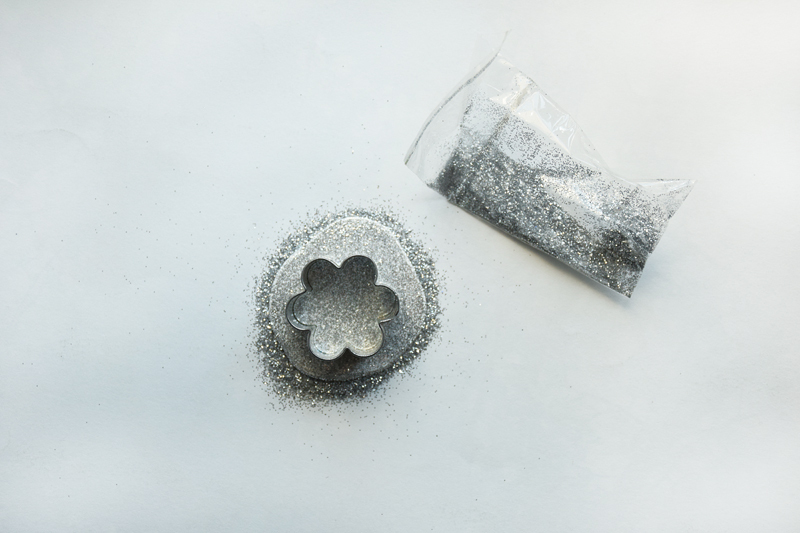 Step 4: To cut more flowers, simply re-roll clay, add more glitter, and cut out. I used three flowers per ornament. Step 5: Roll out your base clay until it’s about 1/2″ thick. 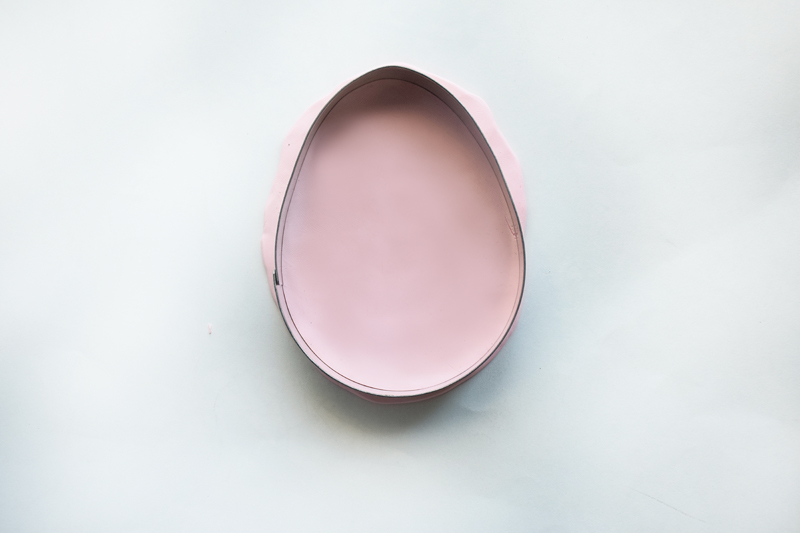 Use your egg cutter to cut your shape. Step 6: Line the outer edge with studs, pressing them down to embed them in the clay. Smooth out any imperfections in the clay. Step 7: Press your three flowers on top of the egg, firmly but gently to make sure they adhere to the surface. 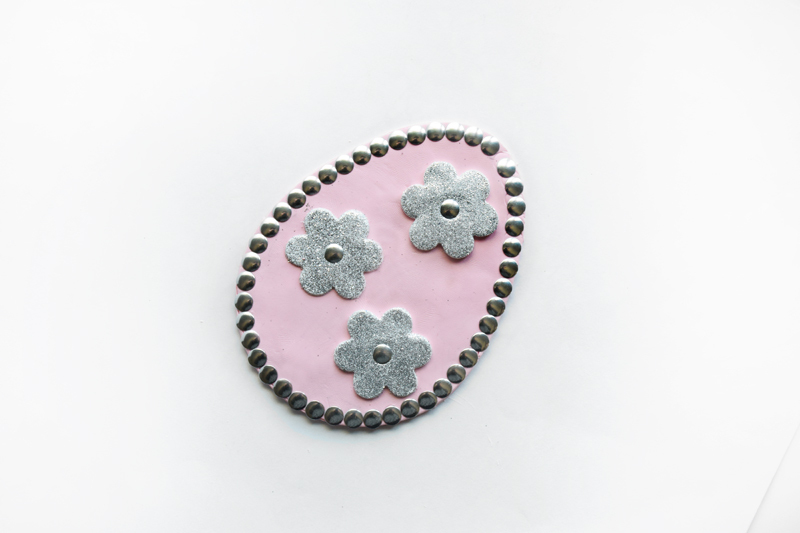 Step 8: Press studs into the center of the flowers. Poke a hole at top, and bake about 30 minutes at 125 degrees or according to package. When cooled, tie organza ribbon at top to create the ornament! 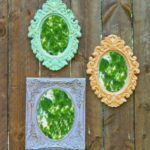 Perfect for a kid’s craft, anyone can have fun making these home decor DIY pieces!! Mix colors (I’d stick with pastels) for a very Easter-type scheme. You can view all of my other tutorials on my blog at quietlioncreations.com! What’s your favorite thing about Easter? 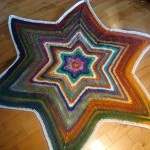 Today we have a guest post from Stefanie Girard from Sweater Surgery! She’ll be sharing with us an easy way to decorate for St. Patrick’s day. For more great tutorials, be sure to check out her blog! Words make a great subject for statement necklaces and die cutting recycled plastic is an easy way to make words for your statement necklaces. I like to use the plastic from take out containers with my die cuts to make jewelry. 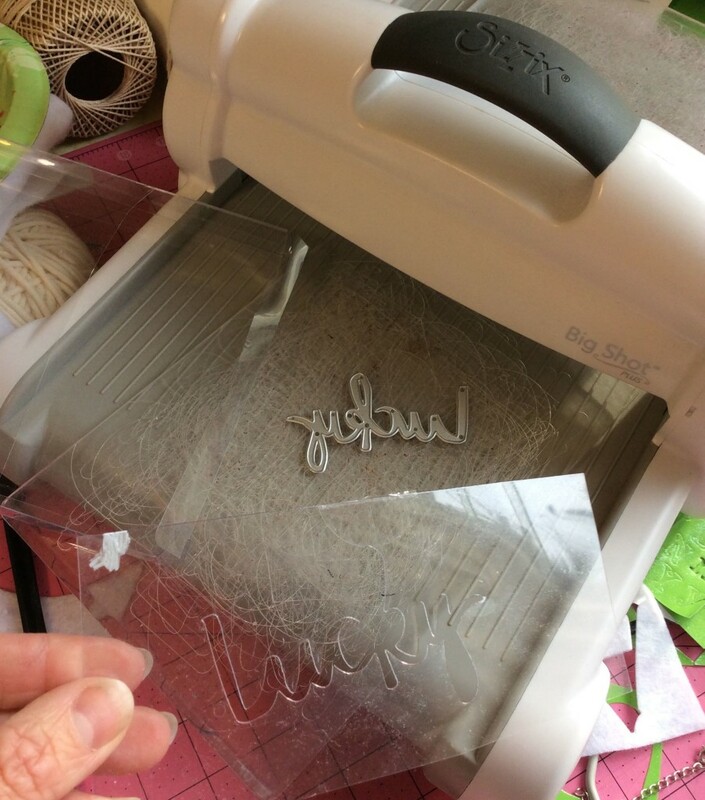 The surrounding plastic left over from the die cut makes a great stencil for future projects so don’t throw it away! To color the plastic a Krylon silver leafing pen works great on the backside of the plastic. To poke the holes for the jump rings I used a large embroidery needle. I simply held the plastic on self healing cutting mat and worked the needle into the plastic from one side until it went through a bit and then from the other side enlarged it more to accommodate the diameter of the jump ring. 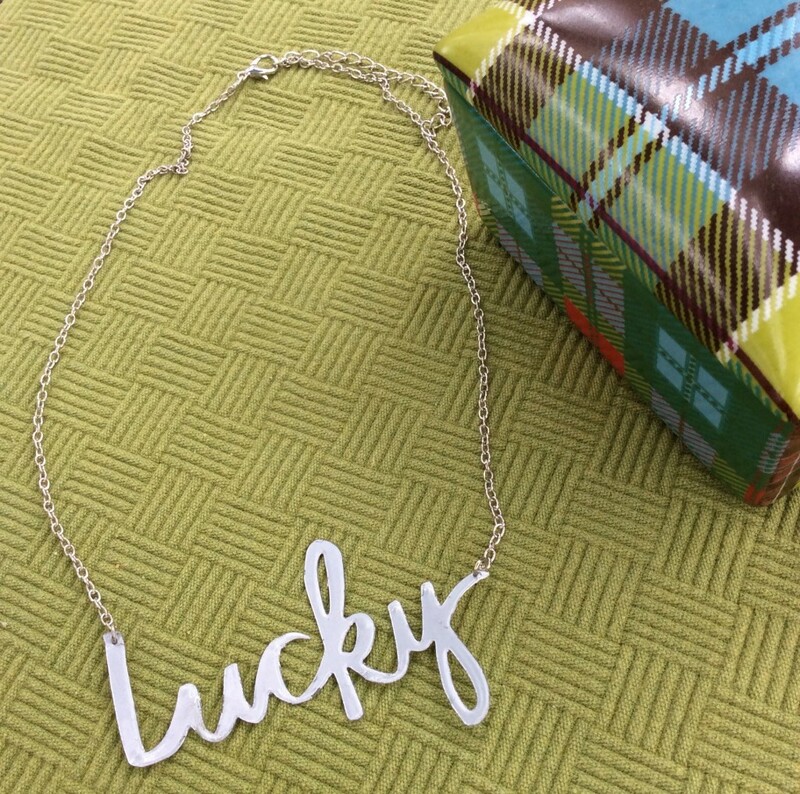 Decide how long you want your necklace and add chain to each side along with your favorite type of clasp and you have yourself a pretty statement necklace featuring the word “Lucky.” I bet your friends will want one too, so you might as well make a bunch to give them for St. Patrick’s Day. 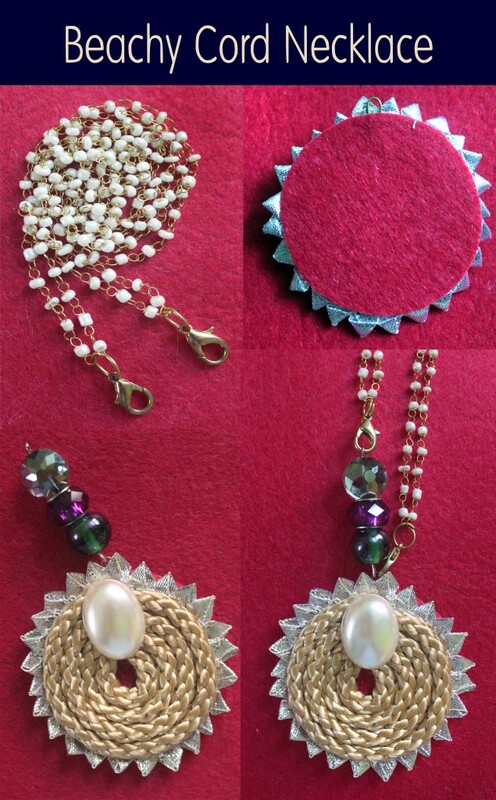 Have you ever made jewelry out of recycled materials? Having lived in a tropical region all my life, I have often dreamt of playing with snow and celebrating a white Christmas. Though I have seen snow on mountains during my travels, I have never been fortunate enough to touch it. 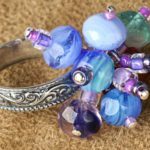 For people like me who live in hot and humid places, snowflake DIY jewelry, charms, patterns, and prints act as surrogates to the real thing, bringing in joyful memories. 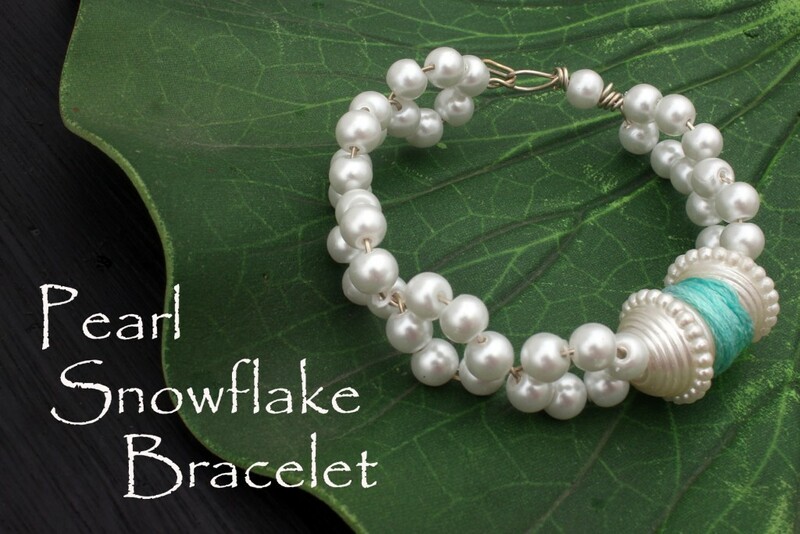 This Christmas, I have created a very simple, snowflake-inspired faux pearl DIY bracelet that could be made by anyone in a jiffy. To make this beaded bracelet more fun and colorful, I have added an asymmetrical component using large bicones beads and embroidery floss. I have used teal blue as my accent color as I wanted to make a cooling and soothing bracelet, but you can use any color you like even giving them away as gifts. 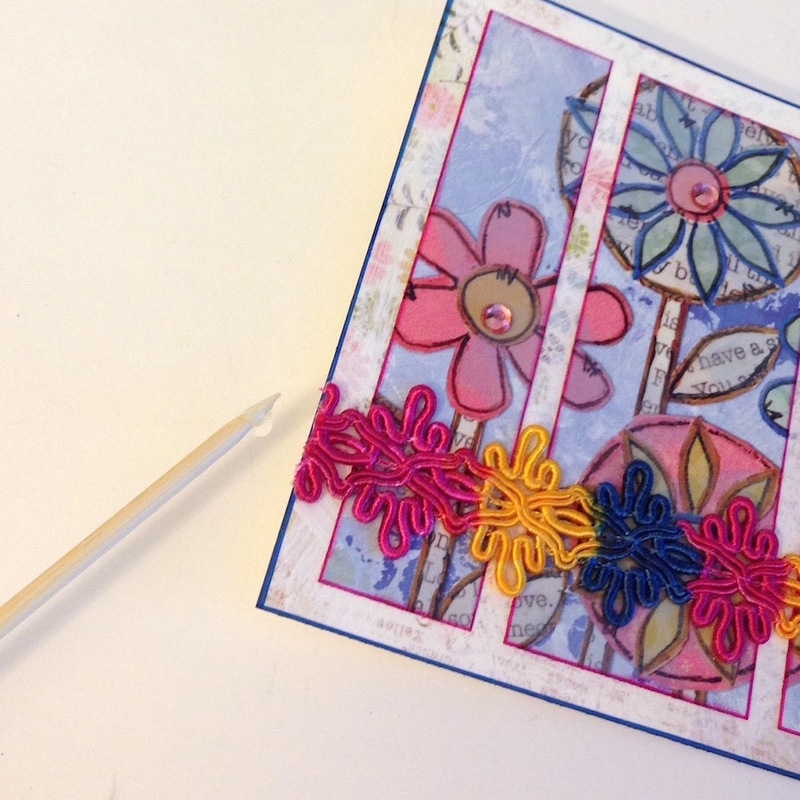 Cut 24″ of artistic wire and fold in the center. Leaving about an inch from the end, twist twice to make a loop. 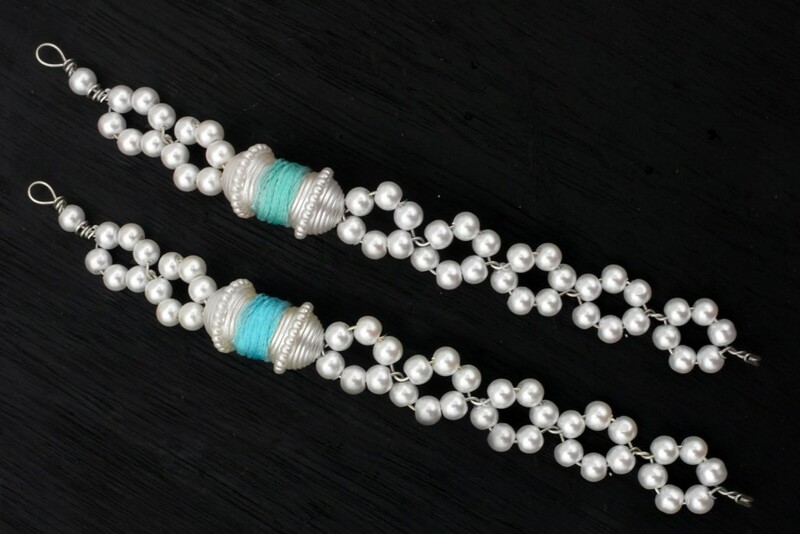 Pull the wires away from one another and add 3 pearls on each side. Twist the wires to lock the beads. 3. Add 6 more beads – 3 on either side and twist to create another snowflake. 4. Repeat 3 more times, until you get 5 snowflakes. 5. Combine both wires and string 2 bicones beads. 6. Splitting the wire once again, repeat step 3 to create 2 more snowflakes. Twist once again in the end. 7. 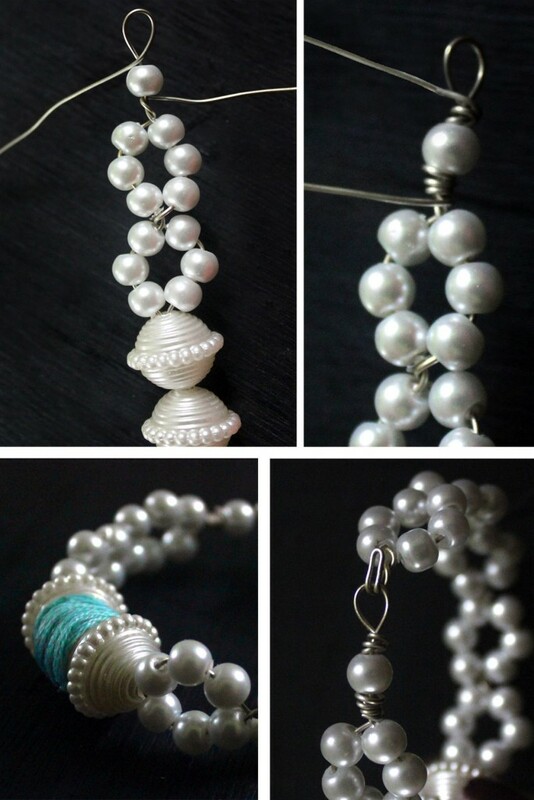 Add a pearl to one of the wires and create a wrapped loop. Cut excess wire and tuck in the end. 8. 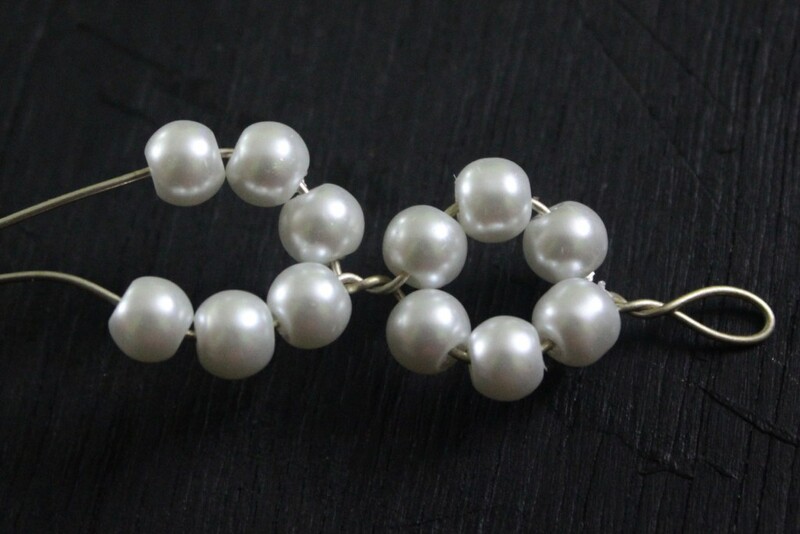 Fold the second wire at 90 degrees blow the pearl and create a nest by wire wrapping. Cut excess wire and tuck in the end. 9. Pinch the loop (step 1) using pliers and fold in half to create a hook. 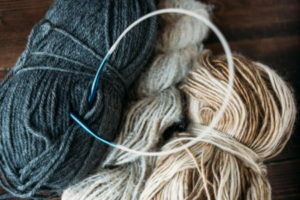 Together with the loop at the other end, it will form the clasp of the bracelet. 10. Apply fabric glue on the bicones (at the juncture where they meet) and wrap embroidery floss on it. It might be a bit difficult in the beginning as the beads will roll, but hold the beads between the thumb and forefinger on your less dominant hand while you wrap the thread with your dominant hand. After 3-4 wraps and the beads will stop moving. I have made around 12 wraps, but you can make more or less as per your wish. Your bracelet is now complete. This bracelet pattern has been inspired by basic beadweaving stitches and made easier with the use of wire instead of thread. Using wire also means that the bracelet can be shaped to fit your wrist exactly and hence will not move around. 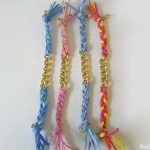 This particular pattern can be made even by a beginner and can be adapted to create a symmetrical bracelet too. Each snowflake is said to be as different as human fingerprints, even though they all have six sides to them. How will you make your own, unique snowflake this Christmas? 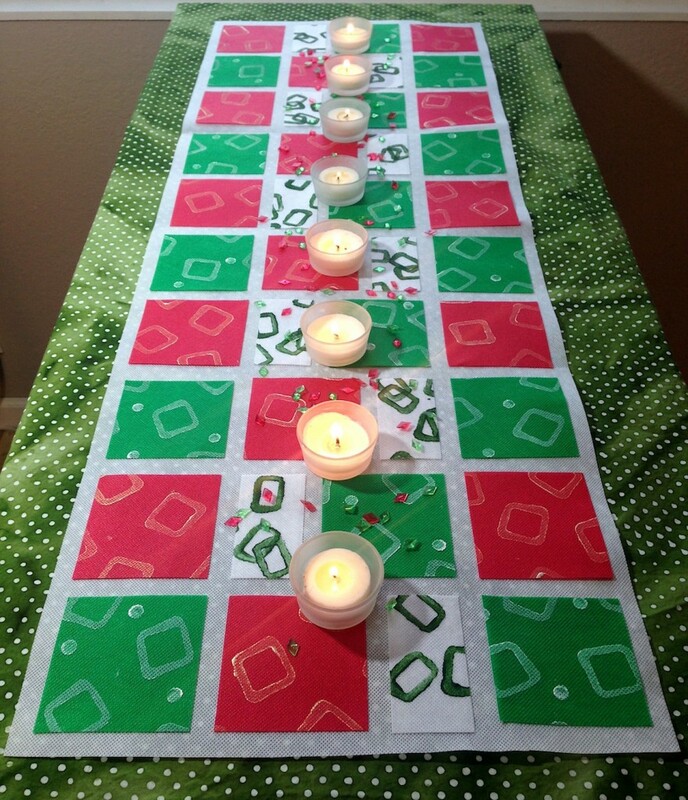 Learn how to make a table runner that’s both a no-sew and budget-friendly Christmas craft idea! Only a few simple steps are needed to know how to make this super fun and festive DIY table runner! Need a last minute table decoration or don’t want to spend too much time making a table runner? 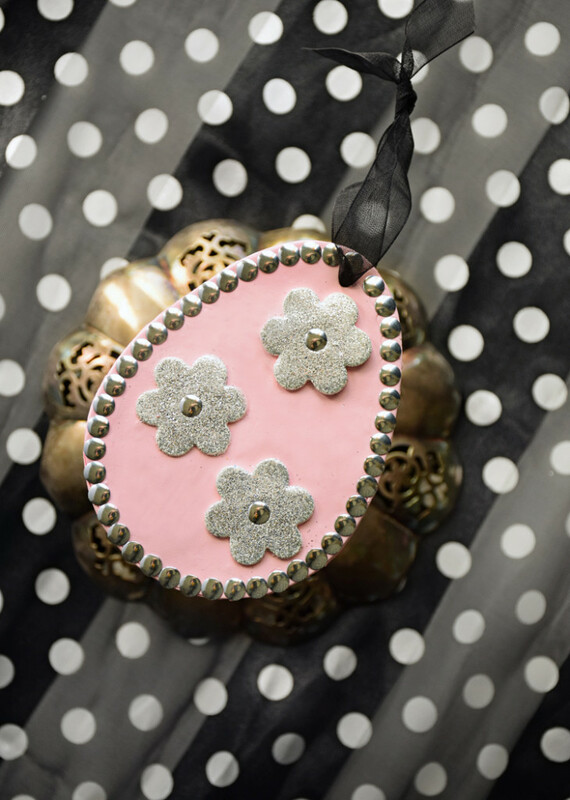 Then, try this easy craft tutorial that you can customize to your needs. 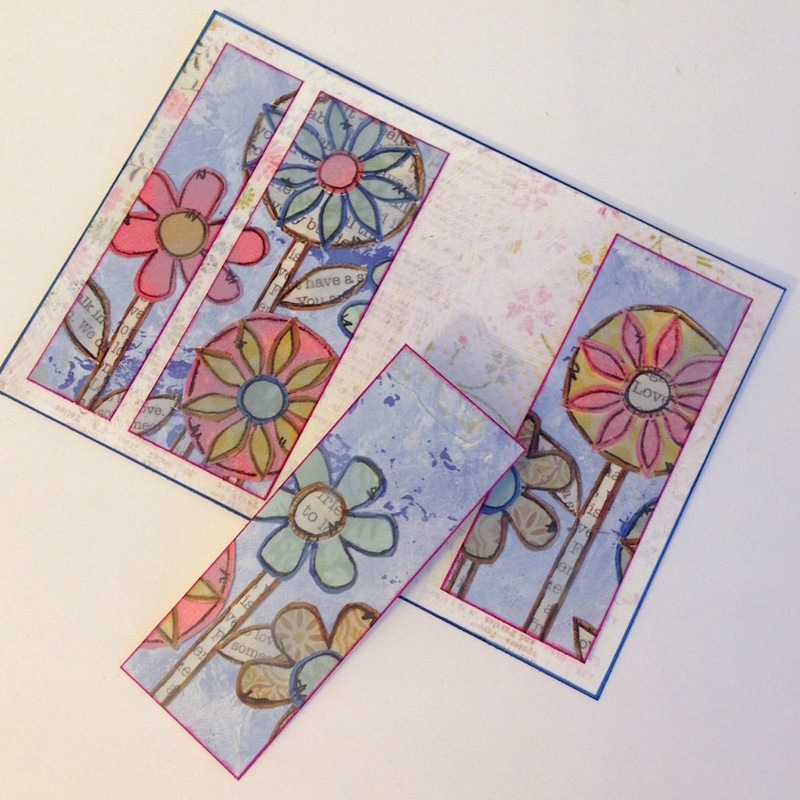 Feel free to make your own designs or to use stamps that you already own. 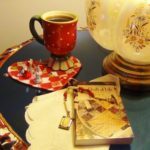 This Christmas table runner combines two fun and easy craft techniques I really love – paint-stamping and mosaics from paper or fabric. And bonus…it’s no-sew, too! This runner is made with a special no-fray synthetic fabric that has a fun pinhole texture, but you could also make this holiday craft project with paper or stitch it up with your favorite fabrics. Decide on the size of your runner and trim a long piece of Oly*Fun yardage to size for the base of your runner and set it aside. 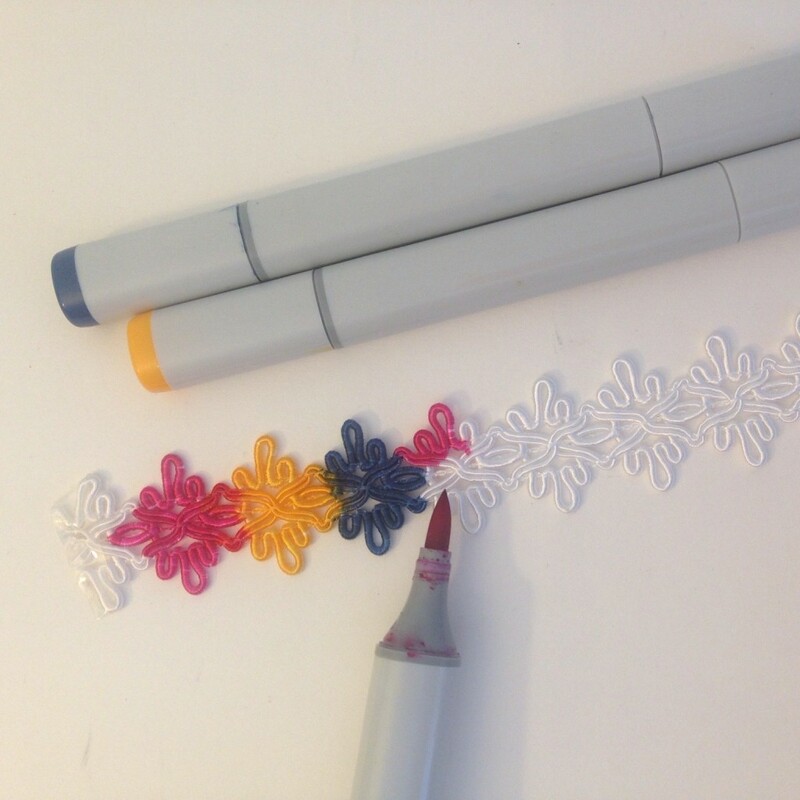 Use your favorite foam stamps (and pencil erasers too!) 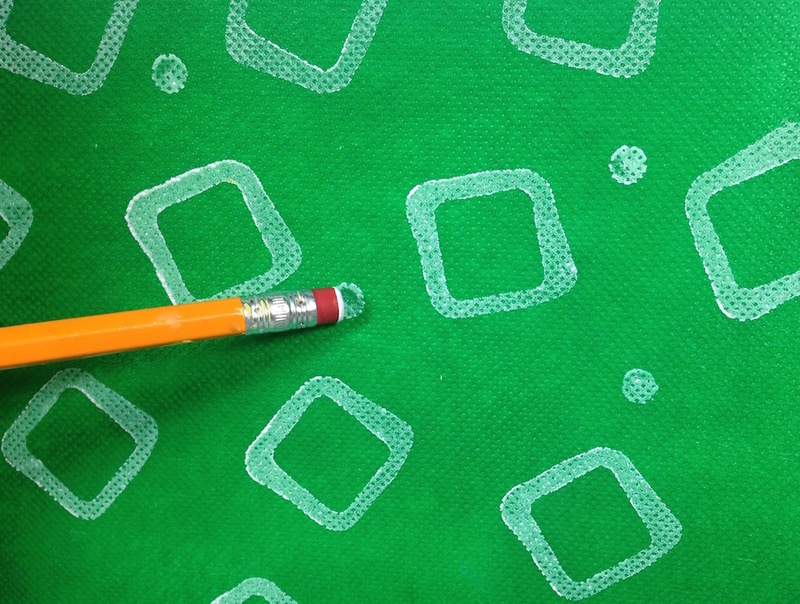 to stamp a random, all-over pattern on 3 colors of the material and let dry. 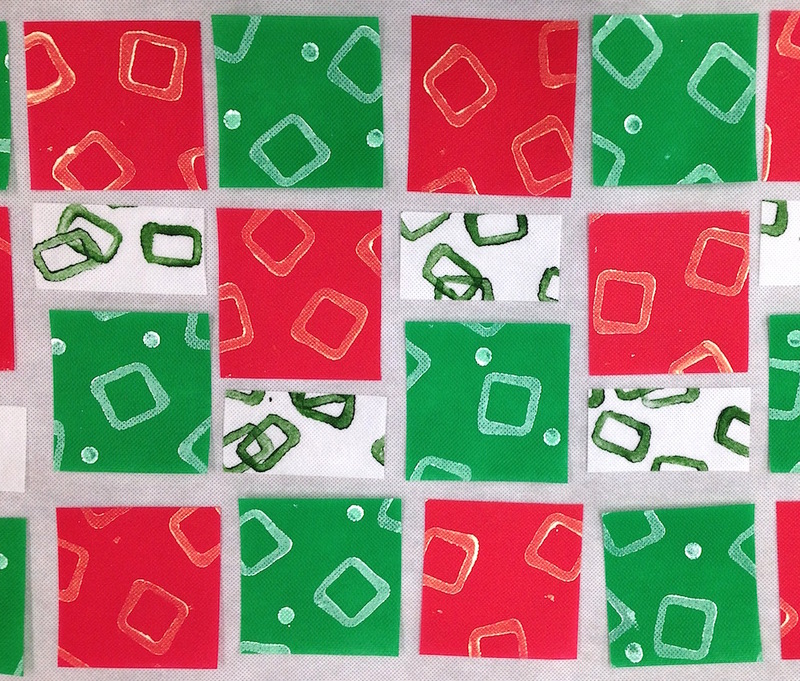 I worked with 12×12″ sheets of green, white, and red. Cut the stamped material into 3″ strips and then into 3″ squares – cut some squares in half for a more varied look to your mosaic. Arrange all the pieces on the runner however you like – I love how random paint-stamped patterns and symmetrical mosaic tiles collide! Adhere two strips of paper-lined tape to the back of each tile, then remove the liners and press each tile into place on the runner. That’s it, you’re done! 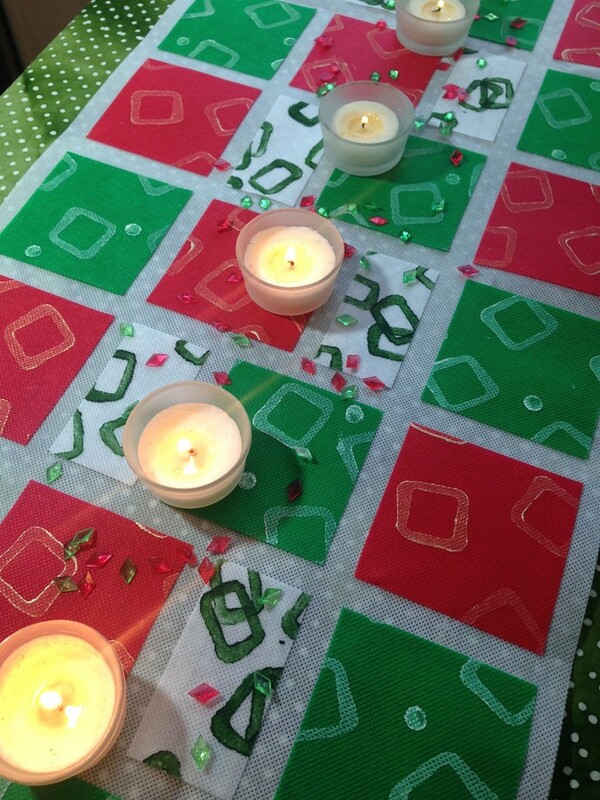 I sprinkled some pretty red and green acrylic gems in between small votive candles to accent the runner on my table. It’s super cute and festive by daylight or candlelight! Comment below and let us know, how do you decorate your Christmas table? Whether you’re looking for a last-minute DIY Halloween decoration for your home or for a party, these two tutorials from Krazy Glue® will come to your rescue! They’re thrifty and easy homemade Halloween decorations that anyone can pull off. So, avoid the crowds at the stores by simply making your own last-minute decorations! 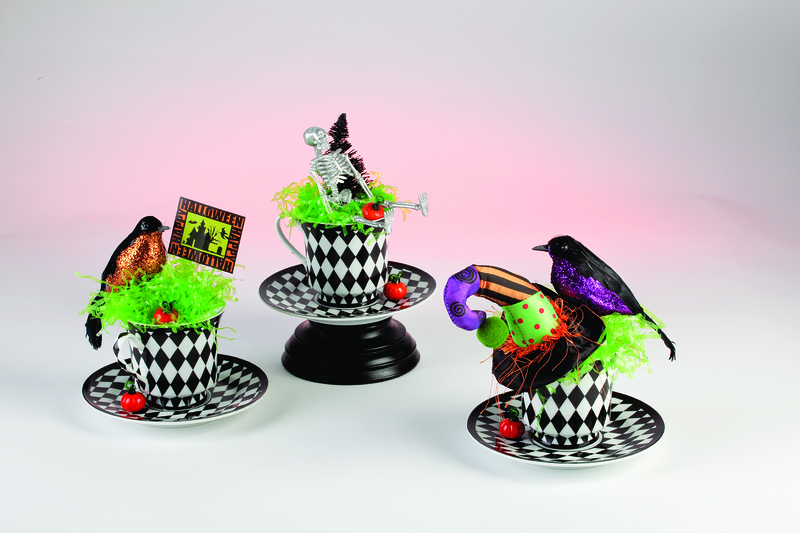 Use Krazy Glue® and Halloween tchotchkes to transform an old tea set into a Mad Hatter Tea Cup Trio. The craft gel formula makes it quick and easy to secure miniature decorative elements in place. 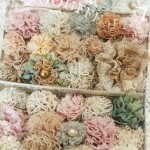 Perfect for a centerpiece, mantle décor or place settings. Broken wooden candle stick or other decorative wood items from the craft store or wood section of the home improvement store. 1. Wipe the bottom of the tea cup and the center of the saucer with alcohol. 2. Glue the tea cup to the saucer with Krazy Glue®. 3. Glue one of the tea cups to a broken wooden candlestick or other wood pedestal. 4. 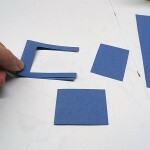 Cut two foam balls in half and glue – flat side up – into the cups. 5. Use 2-3 fern pins to secure the Easter grass to the foam ball. 6. 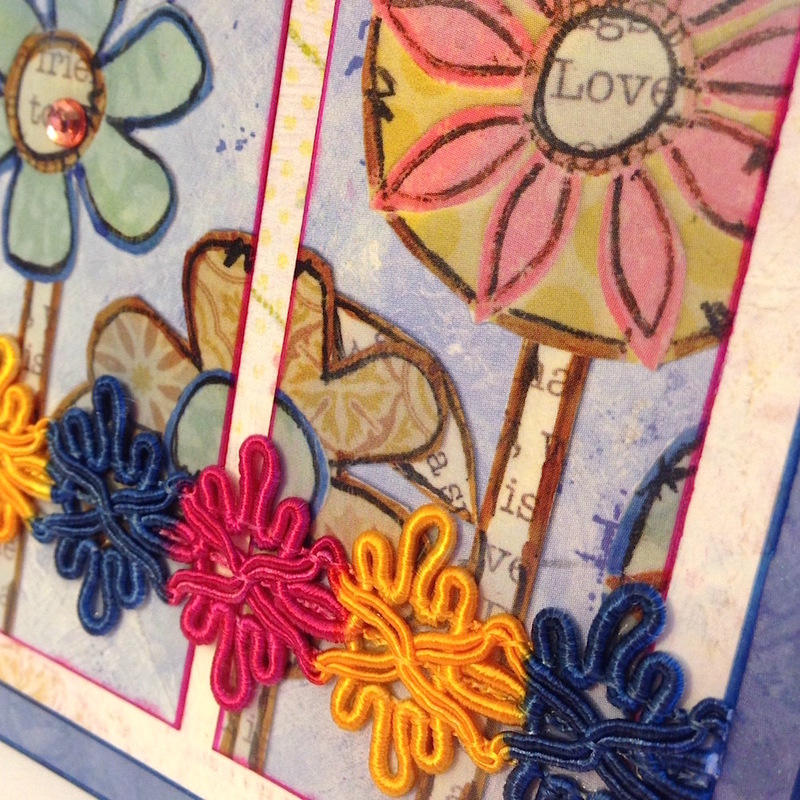 Use Krazy Glue® to glue in the decorative elements as desired. 7. Skeleton – spray desired color and while still wet sprinkle with glitter. 8. Tree – scrape decorative flocking from the tree with the side of a ruler. Spray paint black and then sprinkle with glitter while still wet. Use Krazy Glue, googly eyes, and a set of pipe cleaners to bring life to your Halloween décor. Ideal for indoor décor, or as a candy dish for your neighborhood’s trick-or-treaters. 1. Carve the lid off of the large, round pumpkin. Spray paint large pumpkin, lid and mini pumpkins black. Let dry. 2. Cut out (32) 5-inch sections of black pipe cleaner. Bend pipe cleaners on the end and curve the center for legs. Using Krazy Glue, adhere (8) pipe cleaner legs to each of the small pumpkins. Let dry. 3. Glue the googly eyes to the front of each of the pumpkins. 4. 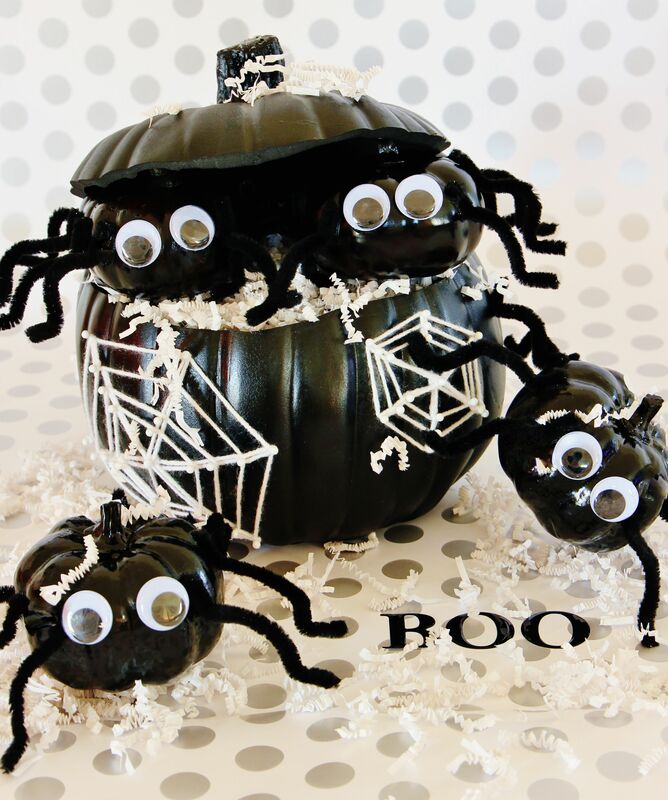 Add pins to the front of the large pumpkin in a spider web pattern. Wind the yarn around the pins to create a web. Secure with Krazy Glue. Comment below and let us know, what are your last-minute Halloween tricks? I love Iris Paper Folding! 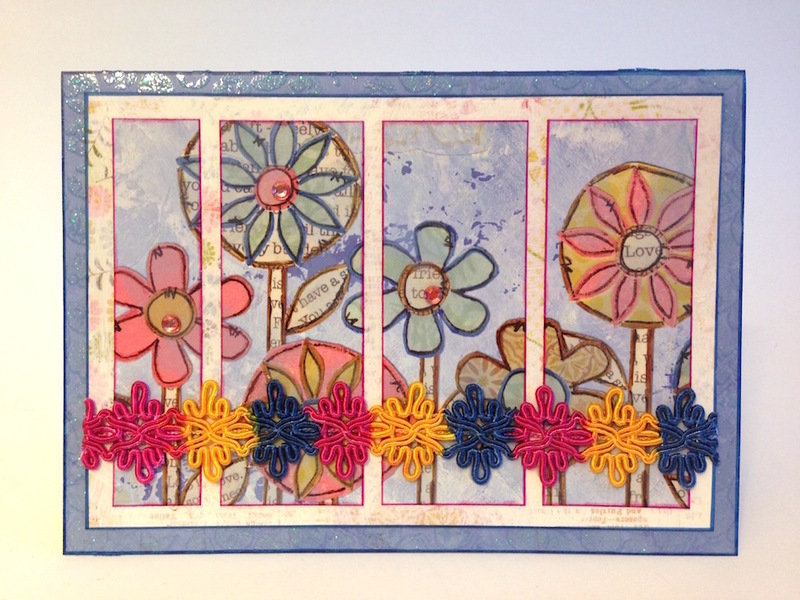 It is fun and relaxing, plus it’s a great way to use up leftover scrapbooking paper. 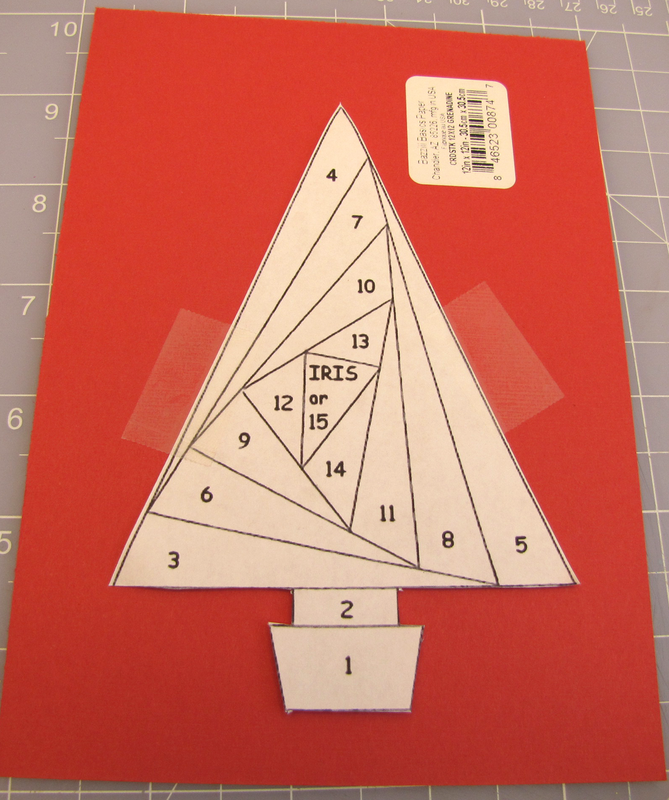 This Christmas tree pattern is easy if you have not tried Iris Paper Folding before. 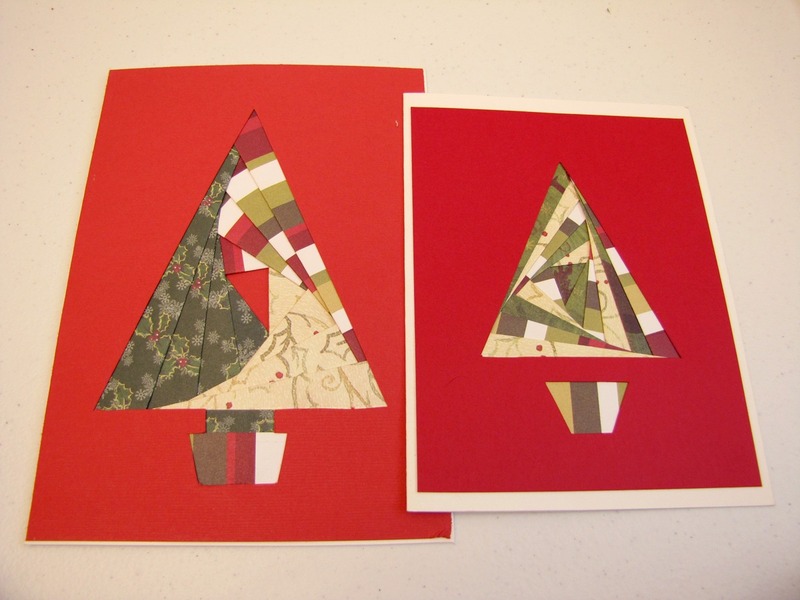 You can create a couple of styles with all of the same pattern/color of paper in one area or alternate them to create another look for your handmade card. 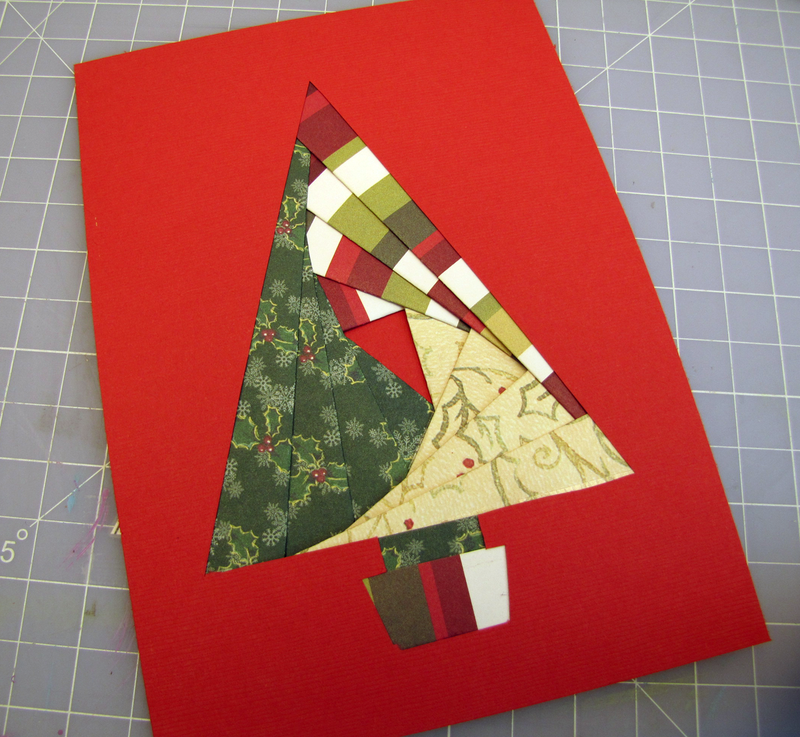 If you’re looking for fun paper crafts for the holidays, then a beautiful handmade card is a great option! Print the iris pattern on lightweight cardstock or copy paper and cut it out as shown with scissors or craft knife. A ruler helps with the straight edges. 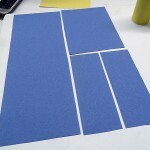 Tape the cut out pattern onto the back of the colored piece of cardstock. 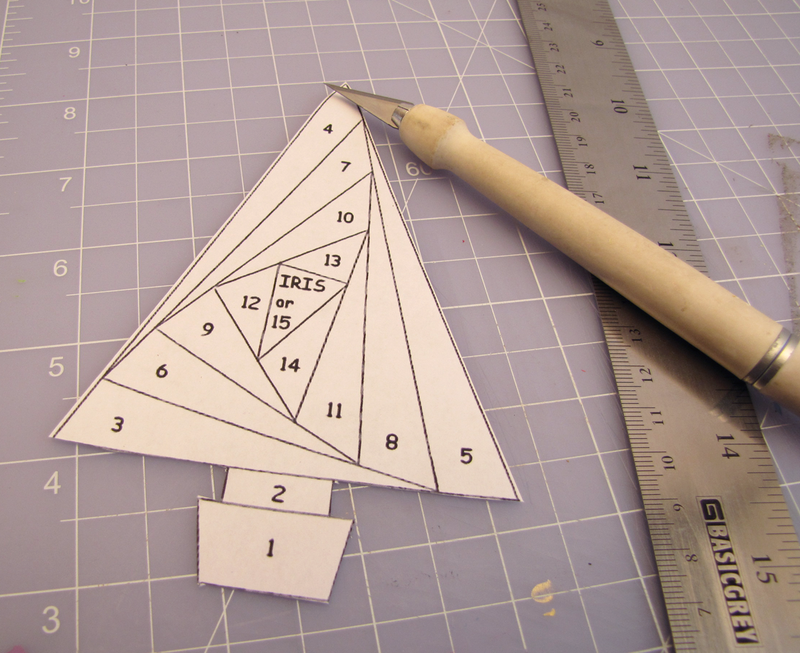 Using the craft knife, cut the center out of the cardstock as shown. 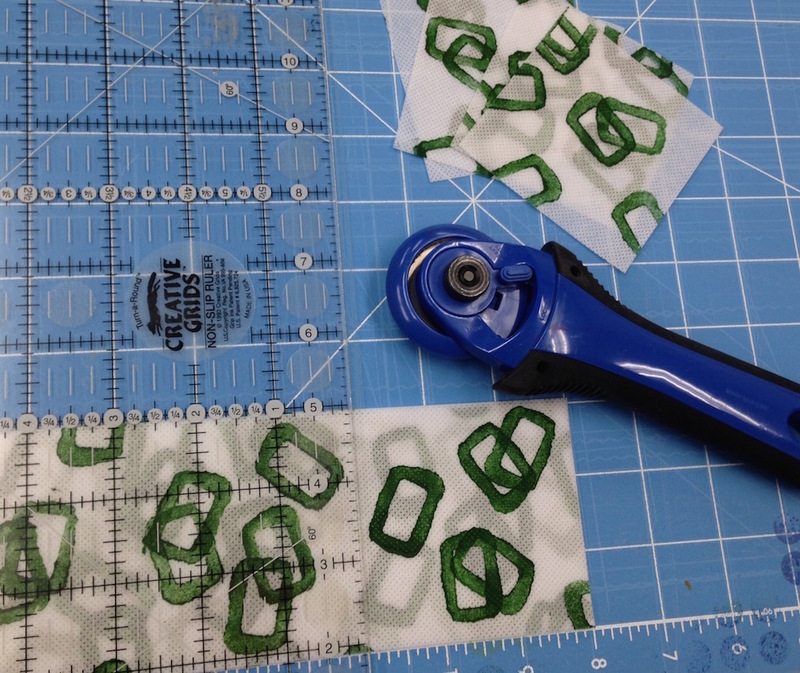 Tape the pattern to the cutting mat. 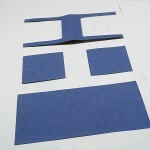 Tape the cut colored cardstock , face down, to the mat with the pattern in the center of the cutout as shown. 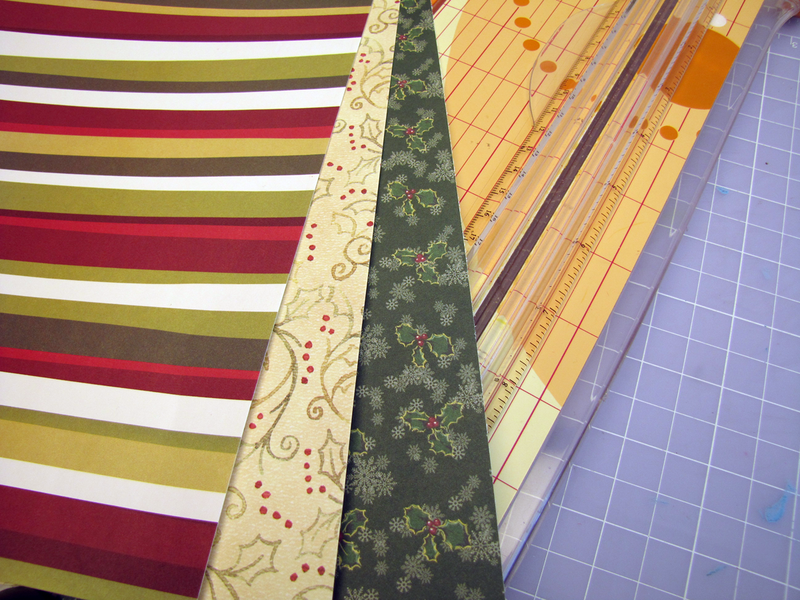 Cut 2 or 3 strips of each pattern of scrapbooking paper into 1 1/2 inch strips and fold in half lengthwise. Use a bone folder to get a sharp crease. 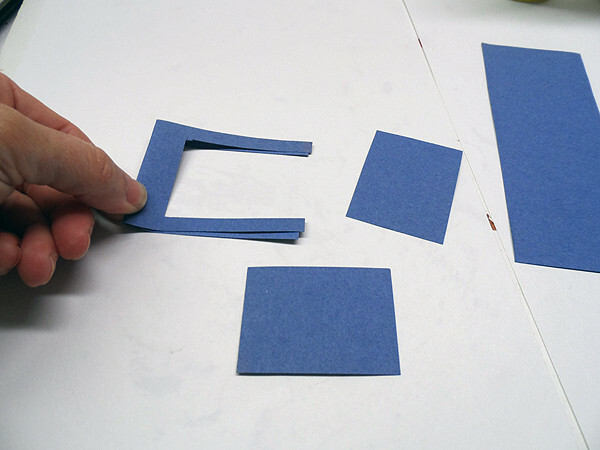 Begin at the #1 position and cover that portion of the pattern with paper. Tape along the outside of the pattern where the paper will overlap to adhere the folded paper to the back side of the colored cardstock. 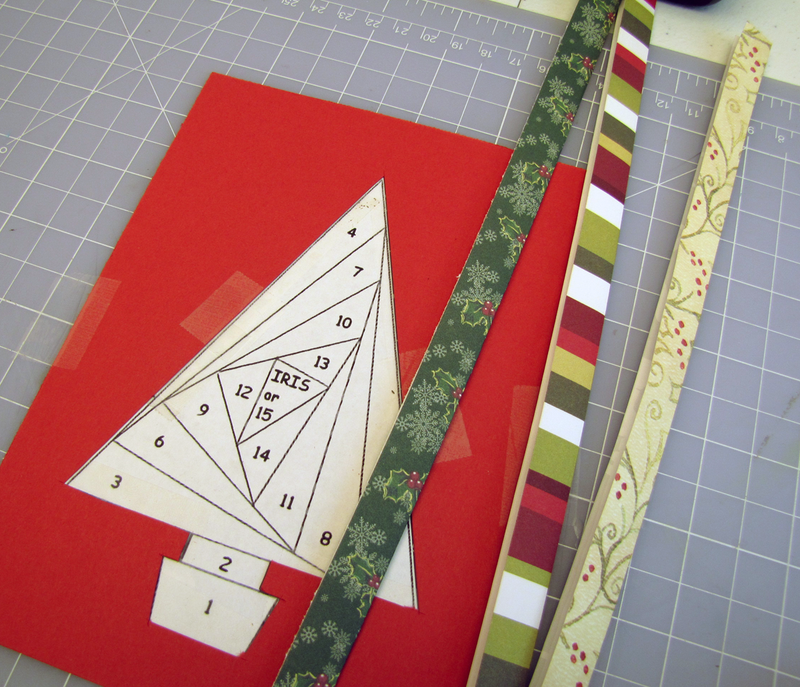 NOTE: The folded side of the scrapbook paper always faces the center of the pattern. 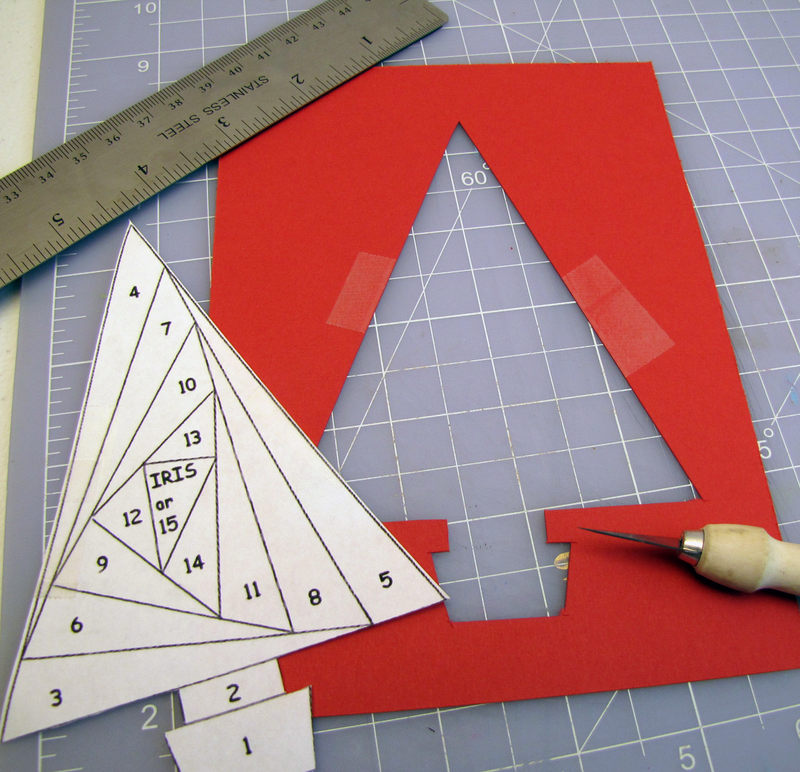 NOTE: You can cut or tear the strips of paper to the correct length. Whichever works best for you. 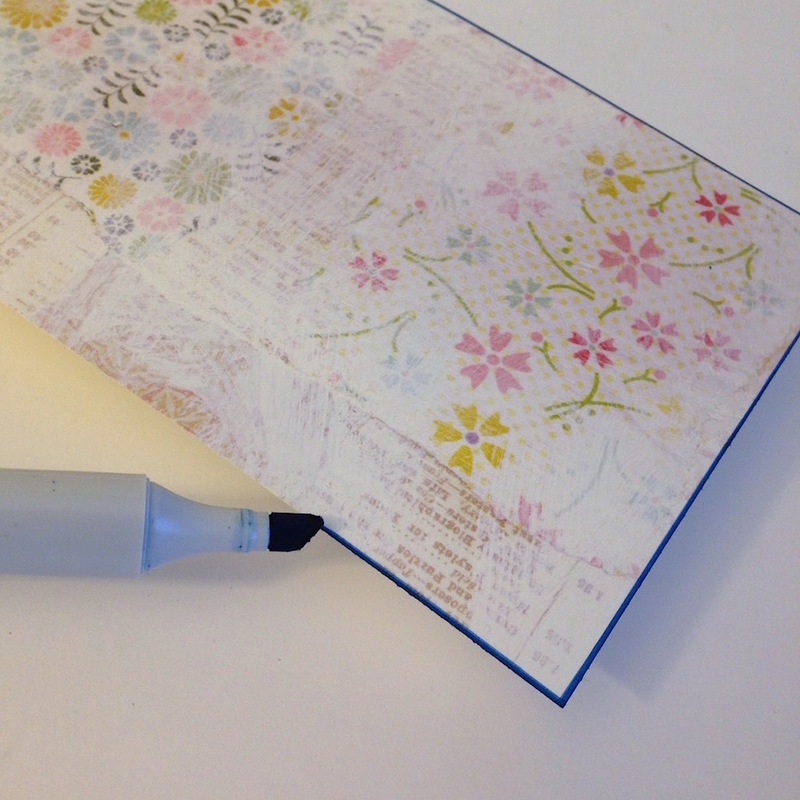 Cover the #2 position with the next color of scrapbook paper. 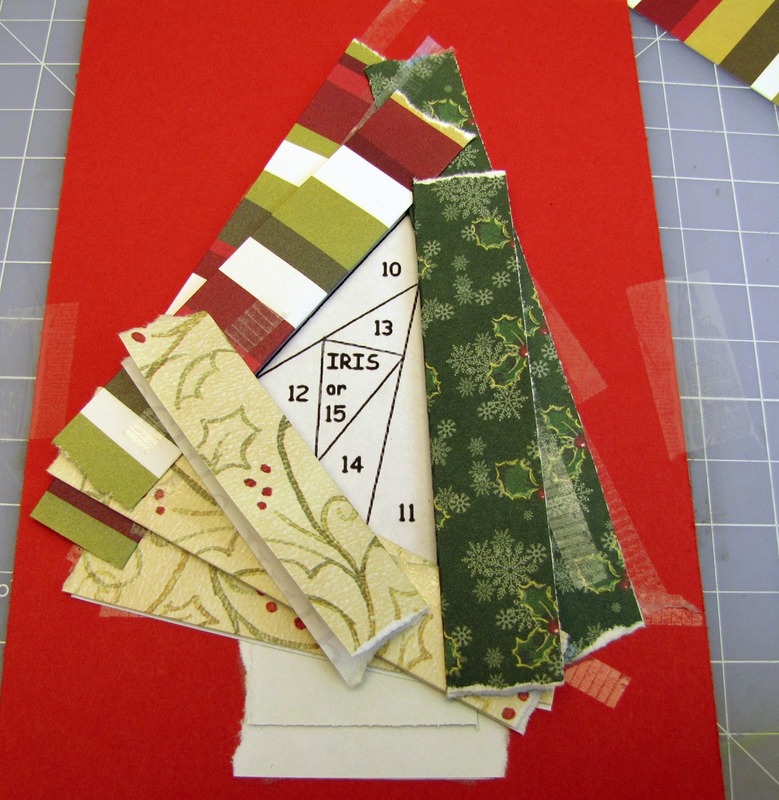 Continue until all of the numbers are covered by taping the strips of paper to one another and to the outside edge of the pattern. 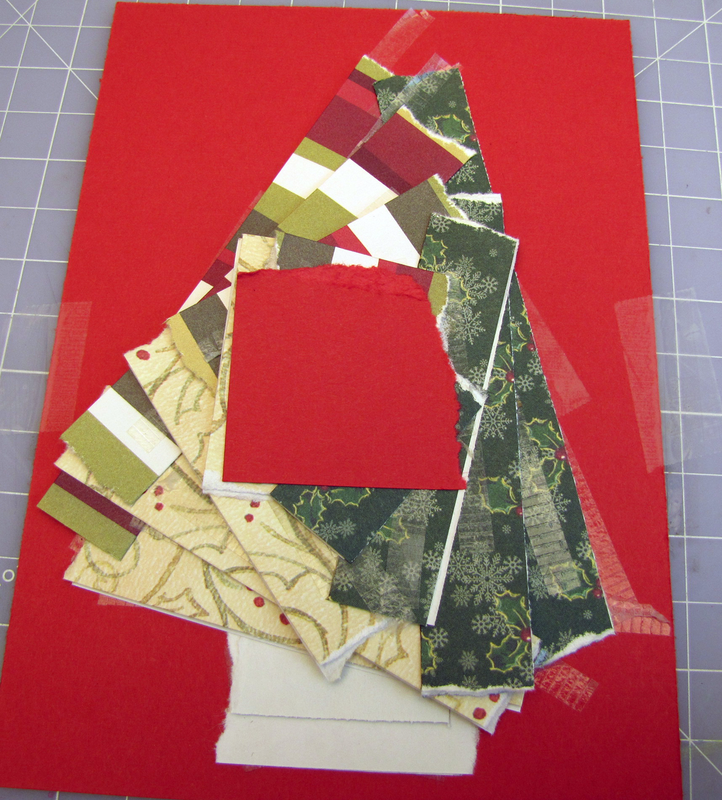 Fill in the center with scrapbook paper or a bit of the cardstock. 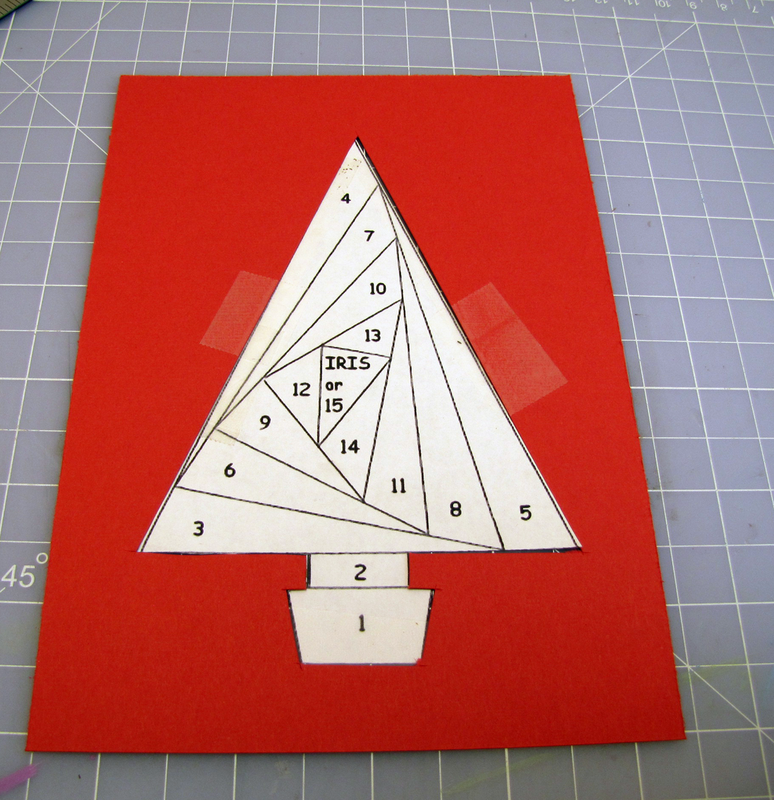 Tape around the edge of the cardstock and center it in the middle of a blank card face. Press well to adhere. What’s your favorite Christmas tree decoration? Around where I live, the scorching summer is now slowly fading and the monsoons are gaining momentum. In my opinion, this is a period when beaches are at their very best. Blue, clean and quite lovely! If you can afford a trip to a beach resort, there is nothing like it, but for others like me, a trip to the local beach can be as equally fulfilling. Talking of beach resorts, the first thing that comes to my mind, apart from long lazy walks on the beach, are the roaring parties that happen at night. How do you dress up for those? Cute shorts or a sundress topped with beads are the cliche looks, but tanks or spaghetti tops with sarongs are a good bet too, particularly when paired with a little dressy jewelry that has a nautical touch with a hint of bling. 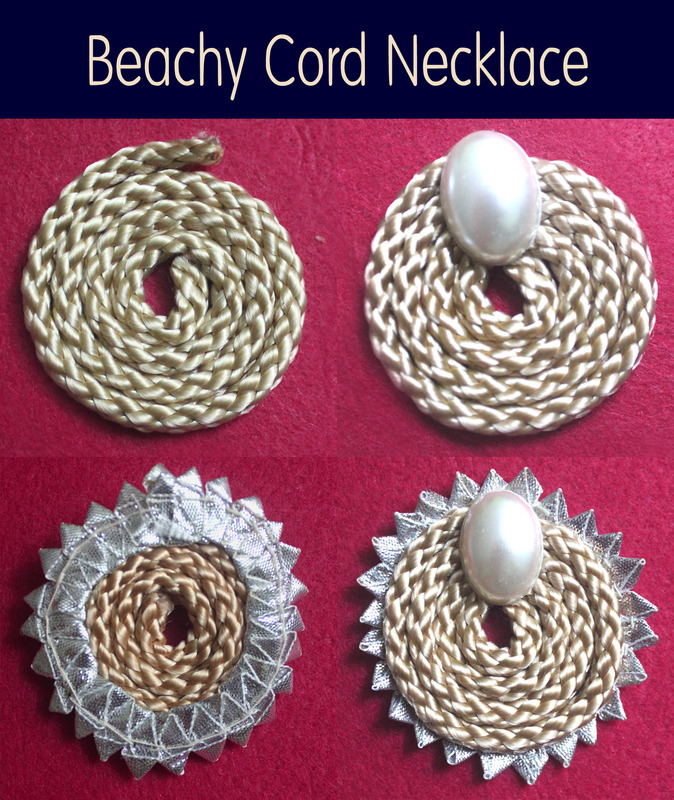 Jewelry with cords, some pearls and shells and something metallic. 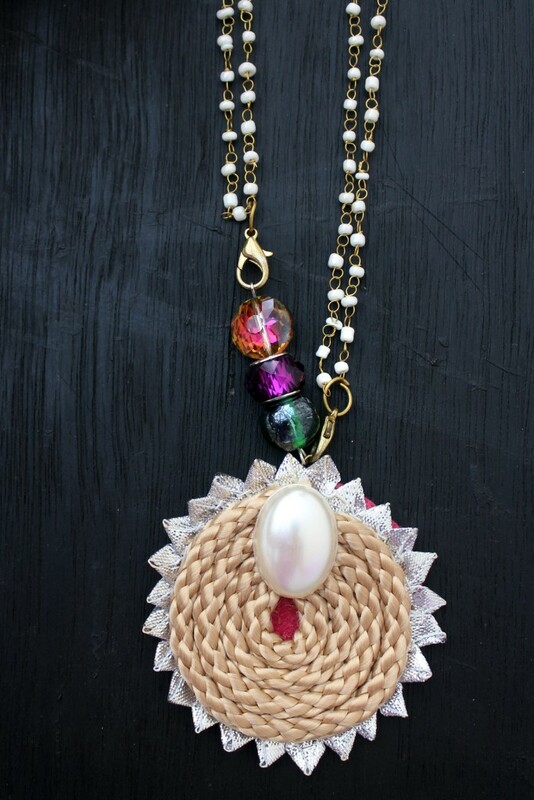 Like this Beachy cord necklace – light weight, colorful and fun! 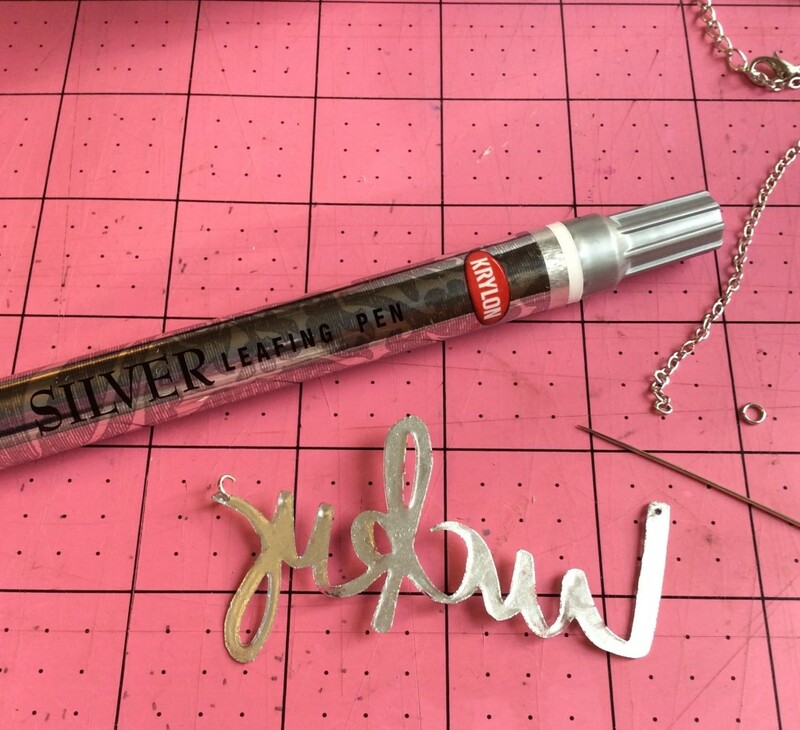 This is an easy homemade necklace tutorial that is sure to have your friends begging you to make them one also. It’s a lightweight chain necklace with pretty accent beads and bright colors. 1. Coil the braided cord, gluing the starting edge to the second round of the cord. 2. Glue a cabochon on to the spiral to cover both ends of the cord. Let it dry. 3. Once dry, flip over and glue the gota strip around the circumference of the spiral. Remember that the spiral itself is not glued to be gentle. 4. 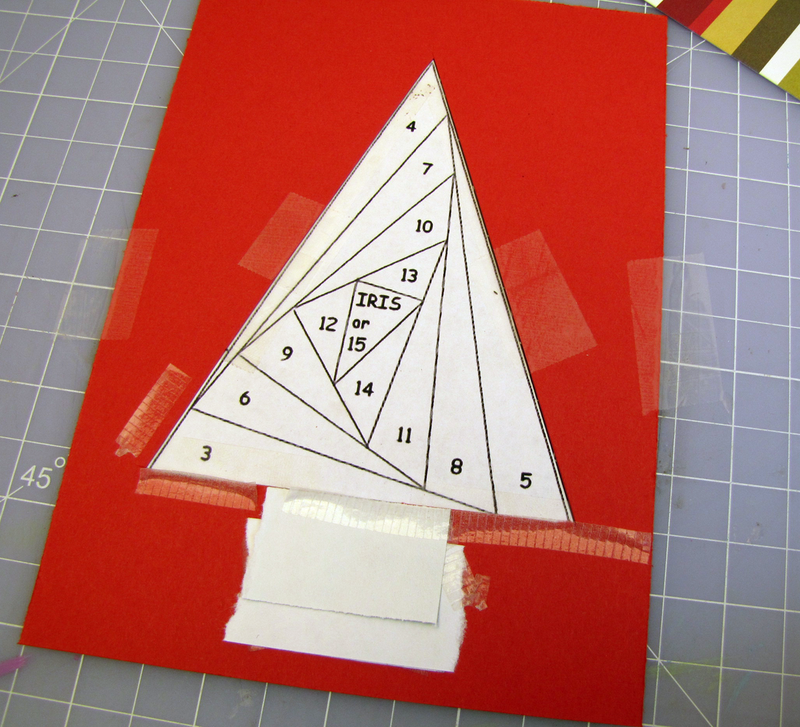 Measure the circumference of the spiral and cut out a circular piece of felt in the color of your choice. 5. Make the loop of an eyepin bigger so that it can be used with a clasp. 6. Spread glue all over the back of your spiral and place an eyepin with the loop facing the top, wherever you want to hang the pendant from. Glue the felt circle on top, sandwiching the eyepin. Let it dry for a good 15-30 minutes depending on the glue that you have used, until it becomes strong. 7. Cut you looped pearl chain into two. To both ends add lobsters clasps using jump rings. This makes you pendant detachable. Clasp both closures, one to the eyepin with beads and other to the eyepin on the pendant. You necklace is now complete. Since the pendant is detachable, you can simply use the pendant with any other chain that has two claps or you can use the chain with any other pendant that simply has a ring. As a variation try, spiraling chain to create your Spiral pendant instead of using cord. So how are you going to accessorize your beach look? SPOILER ALERT! 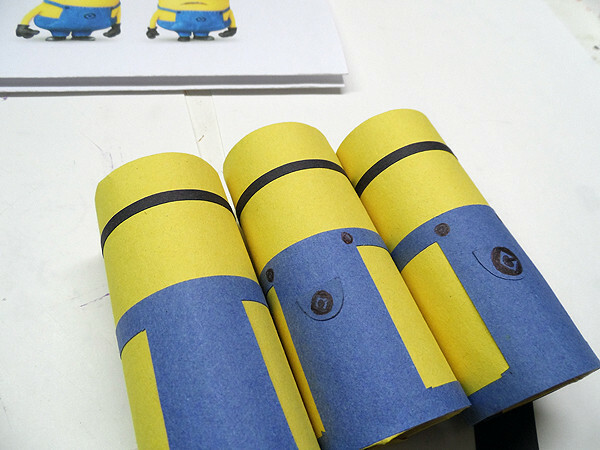 This is an adorable preschool craft in lieu of the new Minions movie, and I wanted to give you a full tutorial of a quick craft for kids. 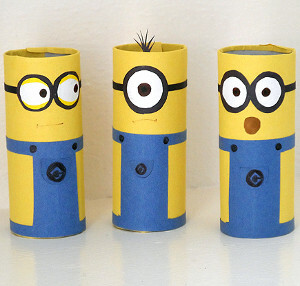 Toilet paper roll crafts are such a big craft because they are always around and there’s so much to do with them. This is a full tutorial for a cute little minion toy that your child can easily take with them anywhere they go. This one calls for the traditional yellow minions, but you can also change it up a bit and make the evil purple minions. I feel like as I get older, the more I appreciate the stuff I took advantage of as a kid, or rather what I didn’t take advantage of. I was one of those kids who wanted to grow up way too fast and was way too serious. So as a 22-year old college student, psychologists would say that I have been trying to make up for my childhood by my Disney obsession, but, like wine, those just get better with age. Being a summer pre-k teacher, you quickly find out what your group of kids enjoy and still challenge their motor skills. Recycling is very important to me to begin with, as is green cleaning, so I loved to implement that in the classroom. 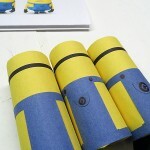 The best part about this brilliant little kids’ craft is that a free printable pattern is provided, so even the littlest minion fans can join in the fun. They can practice their tracing and cutting skills to bring the minions to life. 1. 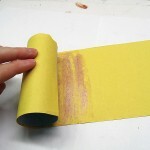 Cut a sheet of yellow construction paper in half lengthwise. You can get two minions from each half. 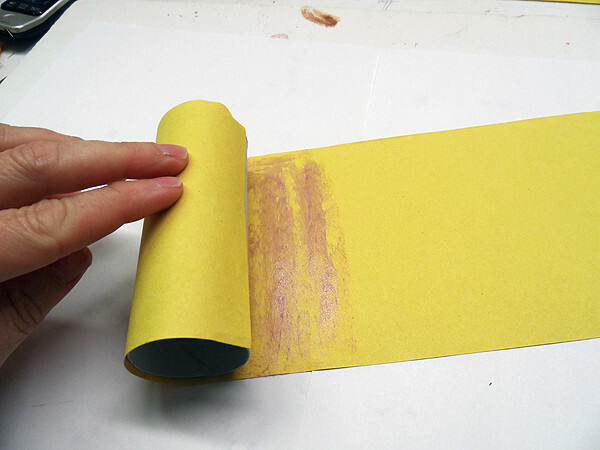 Apply glue stick to the yellow paper and wrap it around the cardboard tube. Trim the excess (about half a sheet) and repeat this process for the next two minions. 2. 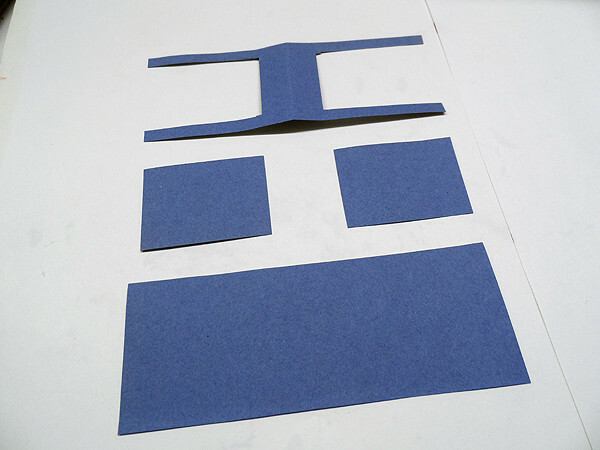 Cut a sheet of blue construction paper in half lengthwise. Take one of the halves and cut it in half in the opposite direction. Now, from one of those halves, cut it in half again, lengthwise. The strips you need measure 2×6-inches. 3. 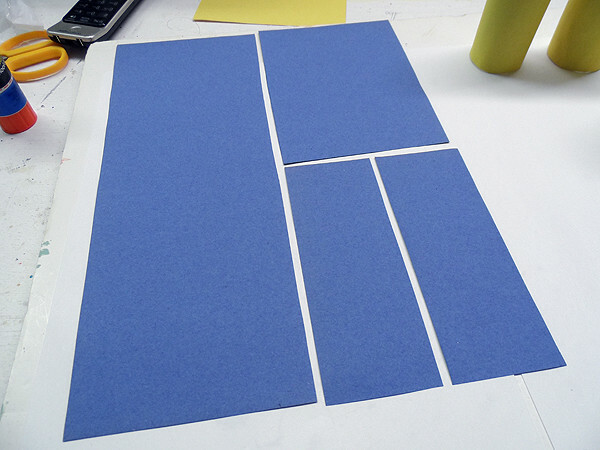 Use the pattern to cut the coveralls out of your blue strip. 4. Glue the coveralls to the yellow tube, lining it up along the bottom of the tube. 5. If you like, you can add the details such as the buttons on the coveralls using a black marker, and the front pocket with the letter “G” onto the front. For smaller kids, you may want to skip this part. 6. Cut a thin strip of black paper, about 1/4″ wide for the giggles. Glue the strip around the head area of the tube, about 3/4″ from the top of the tube. 7. Cut the goggle pieces from the black and white paper. For a minion with one eye, use the larger circles, for two eyes, use the small set of circles. 8. Glue the white circle to the black circle and draw a pupil in the eye using a brown marker. You can add a dot of black to the brown. Glue the eye to the head of the minion overlapping the goggle strap. If you like, you can make the eyes appear to be squinting by adding yellow marker to the white as shown by the minion on the left. 9. Use gray or brown markers to add mouths. 10. If you would like to add hair, cut from black paper and glue to the inside of the tube at the front. Check out this crocheted Evil Minion Baby Hat! It’s so cute that it’s a crime. Who is cuter: the evil minions or the yellow ones?